I’m sitting in a gymnasium at Mount Royal University in Calgary watching the clock count down in the dying moments of a basketball game. The play is fast-paced and aggressive, as you might expect of a Canadian national championship match. On the Saskatchewan sidelines, they chant “S-A, S-A-S, S-A-S-K, let’s go!”, trying to lift their team, until the blare of the buzzer brings an end to the game and their hopes of a comeback. The white-shirted Edmonton Inferno, flame-orange numbers emblazoned on their backs, have beaten the green-shirted Saskatchewan team 56:38. The teams line up and shake hands, and the players mingle beside their coaches. Then, several of the players from Edmonton’s winning team unstrap from their wheelchairs and stand up. They place their bags on the seats and nonchalantly walk, pushing the chairs in front of them, out of the gym. In Canada at least, wheelchair basketball is a chance for disabled and able-bodied athletes to compete with and against each other. I knew in advance that some of the players I was watching do not use wheelchairs off the court, and that these chairs are sporting kit like hockey sticks or bicycles. Yet seeing those players stand up still profoundly challenged my preconceptions. I am so accustomed to thinking of wheelchair use in binary terms: you either use one or you don’t. Now I’m struggling to unlearn that notion. For decades there have been moves trying to integrate the needs of disabled people – often a marginalised minority – into mainstream society. Turning that philosophy into reality has proven a challenge. Humans have a primitive fear of difference, often expressed as negative attitudes to outsiders or those who do not look or behave the way we expect. Overcoming this is hard. Would it help if we reversed things and tried to integrate more able-bodied people into ‘disabled’ activities as well? 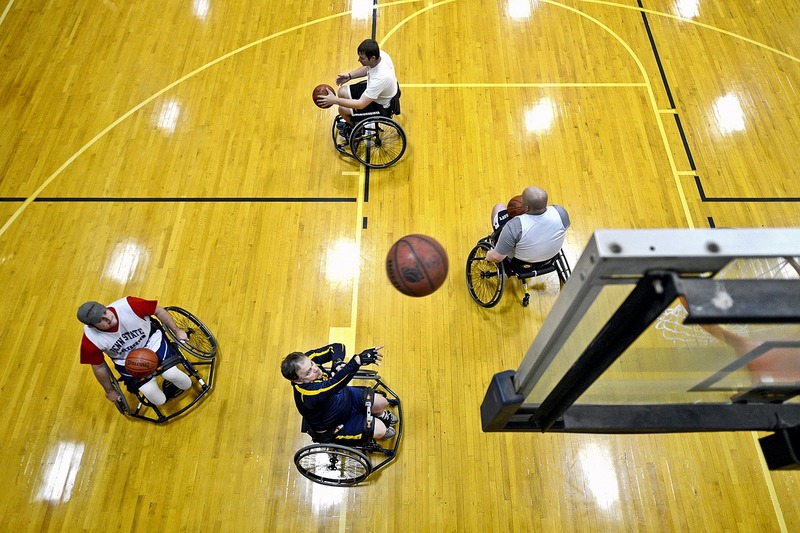 It is well established that relations between different groups of people are improved by face-to-face contact, which is exactly what happens between disabled and able-bodied players in wheelchair basketball (along with a lot of wheel-to-wheel contact, occasionally leading to player-to-floor contact). Able-bodied players become part of a team, a community, with the disabled players. It’s a prime example of ‘reverse integration’, which some people think may help us address – perhaps even overcome – ableism, the stigma and discrimination that surround all forms of disabilities. Danielle Peers is an academic, an expert on reverse integration. She is also a former national wheelchair basketball player and helped to found the Edmonton Inferno team. I meet her in Edmonton a few days before the tournament in Calgary. Tall, slim with short dark hair, she arrives at my hotel casually dressed, a string pendant hanging over her orange T-shirt. Moving quickly across the lobby to shake my hand, the intensity of her gaze is instantly striking. We drive a short distance in her dog-hair-filled Toyota Prius to a downtown Starbucks. Disembarking from the car, Peers walks ahead. She holds the door for me as we enter, propping open the sturdy glass door with one metal crutch. Even this simple action seems purposeful. Her words flow like a torrent – intelligent, pointed, articulate and precise. She is fascinated with what she sees as an artificially sharp dichotomy between disability and able-bodiedness in our society. The reality, she says, is so much more complex, more diverse, less categorical than a simple wheelchair sticker. Wheelchair basketball, with its mixed-ability teams, may be a way to move things on – to, in her words, “do disability differently”. Peers was introduced to wheelchair basketball while playing basketball at college. She was icing her knees after a game of “stand-up ball” when one of the leaders of Canadian women’s wheelchair basketball approached and asked her to come and try out the wheelchair version. Her first reaction: “I’m not disabled!” But she agreed to give it a shot. Peers joined a team, and found another steep learning curve awaited her. Travelling with her disabled team-mates made her realise how many things were inaccessible, how many places she couldn’t invite them to, including her house, and how many totally unnecessary barriers there were. “It’s pretty hard to travel with a team like that and not, after a while, start to feel really angry and upset, about the kind of structural exclusion that exists,” she explains. Having been attracted initially by its athletic challenges, Peers fell in love with wheelchair basketball as much for the community and culture around it. The support she found in that community would prove life-defining just a few years later. Wheelchair basketball has American roots. In 1946, the game was developed as part recreation, part rehabilitation for war veterans being treated for paralysis at hospitals in California and Massachusetts. Within two years, there were six teams from veterans’ hospitals across the country. People had begun to see the sport within the rehab. While the US had ample numbers of disabled people (mostly male veterans) to make up teams and leagues, Canada’s dispersed population made it harder for enough disabled players to find each other, especially for women. So, largely because they needed more players, Canadian wheelchair basketball adopted, in effect, a policy of reverse integration and teams were formed by including able-bodied athletes as well. This brought challenges: “We had a funding problem for a long time,” says Canadian Wheelchair Basketball President Stephen Bach. “The mentality was, ‘Well, no, this is disabled sport,’ and ‘Who are these able-bodied people getting in chairs? !’” It took a long campaign of awareness to dispel that discomfort but today, says Bach, as a game that includes “males, females, disabled and nondisabled, and individuals of a variety of sexual orientations, it is the most inclusive and diversely integrated game that I know of”. The US game holds firmly to its disabled-only roots, but the Canadian model has spread to Australia and parts of Europe. The benefits go beyond just making up the numbers: “Once we started having more able-bodied involvement it brought a lot more ‘sport people’ to the sport,” says Marni Abbott-Peter, who plays on and coaches the British Columbia team and is a four-time Paralympic medal winner for Canada. As the original medical ethos gave way to a sporting one, it attracted good athletes, better coaches and, over time, better equipment. It also changed the way participants thought of themselves. In 2008 and 2009, Peers and fellow researcher Nancy Spencer-Cavaliere conducted a study, for which Spencer-Cavaliere interviewed nine female wheelchair basketball players. Many of them said that reverse integration contributed to their self-concept as athlete, rather than athlete with disabilities: “If you’re out on the street on an average day, the first thing people would see would be the wheelchair, but when you’re on the court and you’re all in your chairs, it doesn’t matter if you’re AB [able-bodied] or not,” one interviewee said. As well as the fact that people of different levels of ability and disability can play together, I’m equally struck by the age range of the players. Another former Paralympian, Lori Radke of the Calgary Rocky Mountain Rollers, explains to me that on her team the ages range from 13 to almost 50. That’s almost unheard-of in able-bodied sport, and Radke admits that it makes for some challenges. Yet it’s also eye-opening: “For our 13-year-old, who has never [previously] been involved in sport, she is learning from some very experienced people, not only about wheelchair basketball, but about life,” she says. Several of the players interviewed by Spencer-Cavaliere reflected on the game as a means of sharing experiences. Even disabled team-mates’ eyes can be opened, because of course everyone has different experiences, whether it’s travelling with a disability, dealing with pressure sores or bathroom bowel routines. Given the range of abilities and disabilities in play, wheelchair basketball accounts for players’ differences through classification. Originally a medically based system, modern classification now focuses on how well each player is able to move their upper body. Under international rules, each player is given a score between 1.0 and 4.5 – the higher the score, the smaller the functional limitations. In most wheelchair basketball divisions within Canada, the total point count of each team’s five players on the court cannot exceed 14. Able-bodied athletes score the maximum 4.5 in Canada, but they are still not allowed to compete internationally. This meant that Peers, despite having rapidly risen from beginner to elite player, knew she couldn’t play for Canada’s national team. She had always had problems with her knees, but “gimpy knees”, as she describes them, were not grounds for a classification. Or so she thought. Toronto, 2001. The National Wheelchair Basketball Championships. Peers was wheeling her chair across the gym after a game when her gait caught the eye of a classifier. Peers was asked to walk back and forth. It was a strange and awkward situation; she later described feeling as if she was naked under the classifier’s watchful, judging gaze. She was asked a lot of questions, and at last the classifier suggested she see a neurologist. Eligible at a stroke to compete at the highest level, Peers was soon selected for the Canadian women’s national wheelchair basketball team and won a bronze medal at the 2004 Paralympic Games in Athens. Her delight in getting the diagnosis and being picked and winning a medal was accompanied by a series of baffling experiences at the Paralympics. Peers recalls the pressure placed on athletes on the Canadian team, even those who could walk, to stay in their chairs in public for fear of challenging the image of disability. “I still walk,” she replied. “But you are a Paralympic athlete,” said the reporter. So Peers explained that wheelchair basketball athletes don’t need to be full-time chair users to participate. She explained that it was “a really, really exciting thing that I got diagnosed because now I had access to tools and I could play”. She was trying hard to counter the usual ‘tragedy of disability’ narrative. When the piece was published, it was titled ‘How it feels to no longer walk’. Such experiences drove Peers to set out on her academic exploration of the misunderstood world of disability she had walked into. Part of her research was to investigate whether reverse integration, through wheelchair basketball or other activities, could really change ableist expectations and behaviour. To her surprise, she found very little had been written about it before, although a few studies did suggest it had potential. At the University of Lincoln in the UK, Adam Evans led a study that assessed the attitudes of 49 non-disabled 10-to-12-year-old schoolchildren before and after a 12-week wheelchair basketball programme. Evans and his colleagues found that pupils initially emphasised the “otherness” of disabled bodies and viewed disabled sport as inferior and not “real”. A boy named Sam described the “boring” nature of wheelchair basketball: “In, like, normal basketball they can do slam dunks and stuff, and run around, and do something really interesting,” he said, but disabled players “just sat down”. Sam and the others soon discovered the physically demanding skills involved in wheelchair basketball. One girl, Anne, said: “My arms and back are killing. It’s really tiring moving because you have to use both arms all the time.” By the end of the programme, students had begun to focus on the similarities between themselves and physically disabled people. The programme also challenged their ideas of what ability means in sport. “Because it was so difficult they began to ascribe value to it [and] it challenged some of the preconceptions they had about physical ability,” says Evans. Can short-term experiences like these have a long-term impact on children’s attitudes towards disability? That remains to be seen. Reverse integration has begun to be used and examined in education, too. Kimberly D Schoger used to be a teacher and is now a researcher in educational psychology at the University of Houston in Texas. When teaching in a local public school, she developed a programme that provided a small number of disabled students, in kindergarten to grade 4, with age-appropriate interactions with non-disabled students. When Peers first greeted me in the lobby of my hotel, she was using crutches. When she took me to her dance class that evening, the Solidance radically integrated dance community co-founded by her partner, Lindsay Eales, she got into her wheelchair to dance. At home, she gets up out of her wheelchair and walks. “A wheelchair is like glasses, like hearing aids,” she says. “They are tools that we use when they’re useful, and not when they’re not. “When I got my diagnosis and started using tools… I had to actually learn how to act like a disabled person.” It was a lot of work. She explains that there is an expectation that disability is an all-embracing identity that has to define you in a particular way. It “really delimits your choices, but also delimits the ways that people engage with you,” she says. In her academic and artistic work, though, Peers challenges this social discomfort head-on. Her work is multidisciplinary, encompassing academic research but also performance art, dance and films that parody disability stereotypes. “I’m interested in breaking down the binary between able-bodied and disability,” she says. Although it might make people uncomfortable, she sees huge potential for social progress if those expectations can be changed and communities become more integrated. “Experiences with disability are what have enabled me to embrace interdependence, and build much stronger caring communities, and imagine and create communities that flourish through difference as opposed to through sameness,” she says. Note on terminology: The author has used language that disabled people employ to describe themselves in North America. Terminology is different in other parts of the world. Any offence is inadvertent.